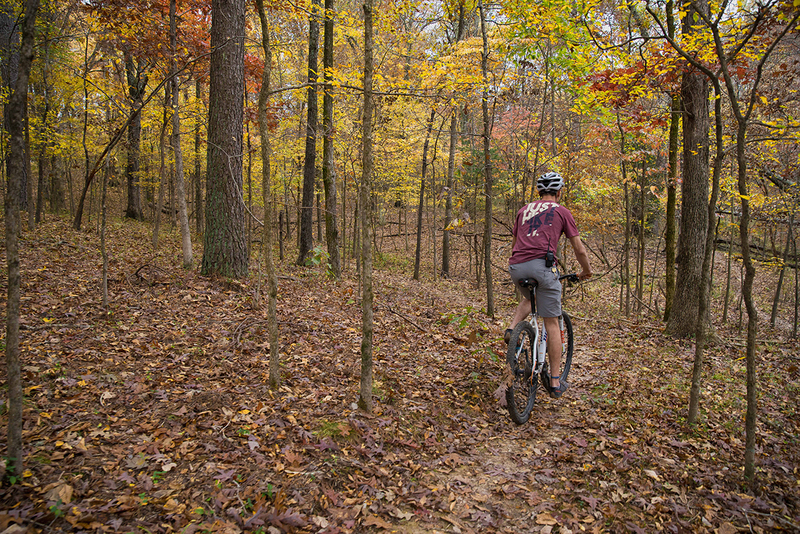 CARBONDALE, Ill. — Could Southern Illinois University Carbondale soon boast one of the Midwest’s premier mountain biking parks? Thanks to some imagination, hard work, determination and a new grant, that’s a very real possibility. Staff and volunteers have already been hard at work SIU’s Touch of Nature Environmental Center forging a pathway through the beautiful Shawnee Forest – a pathway for biking and other recreational purposes. The recent award of a $200,000 federal grant is a big shot in the arm for the project, according to JD Tanner, Touch of Nature director. Mountain biking is becoming a big business these days and the hunt is always on for great trails, Tanner said. He knows that the terrain in Southern Illinois is perfect for the sport but there’s currently not much on the map. So, he and his team went to work about four years ago, dreaming and planning. SIU’s forestry department and Touch of Nature have partnered to secure $47,000 in SIU Green Fund grant awards to develop a 10-year land management plan for the facility. Students and faculty have worked together on the project, giving students practical experience to supplement their classroom learning. A substantial segment of that management plan includes the International Mountain Biking Association’s (IMBA) Conceptual Plan and partial trail design that Touch of Nature staff raised $22,000 in public donations to have IMBA create. Touch of Nature staff members also secured a third Green Fund grant for $11,615 in 2017 to provide an IMBA trail-building clinic for staff and community volunteers, teaching them the fundamentals of sustainable trail building and design. Another $8,000 in grants and donations went toward archeological surveys of the land where the trail is being built. A trail system, about 30 miles long, was mapped out in such a way as to be sustainable, durable and low-impact for the environment. They quickly came to realize that this trail system, the first of its kind in the region, would be a big draw for a variety of populations. Although bikes were the impetus for the project, the Touch of Nature Multiuse Trail System will, as its name indicates, have more than one use. It will be open for hiking and running and will offer a variety of volunteer and educational opportunities for SIU students, staff and community members. From beginners to advanced riders and walkers, the new trail system will appeal to all, officials said. SIU is the only university in the country with a multi-purpose/bike trail of this size, and organizers note that while serving as a great boost for tourism, it also offers a quality of life boost for area residents. In addition, the trails will offer a unique opportunity to explore the beautiful Shawnee Forest. Volunteers have been the backbone of the project so far, officials said. Isaiah Tanner began working on the project as a graduate student. After graduating in May with his degree in outdoor recreation and resource management, he continued to lend a hand as a part-time SIU employee. This past summer, Tanner worked with a variety of groups on the trails. Volunteers from the Youth Conservation Corps in Oklahoma leant a hand as did tribal teens from the Shawnee Conservation Corps and participants in the American Hiking Society’s Volunteer Vacation program. Touch of Nature has also sponsored a series of trail-building days, welcoming community volunteers to help clear trails. The center provides all of the equipment and refreshments while people give of their time and energy. Students helping with the work can log volunteer hours that help them qualify for the Environmental Ambassador Award as well. The Illinois Department of Natural Resources announced recently that Touch of Nature would receive a $200,000 Recreational Trails Program grant, with a substantial portion of the funding actually coming from the Federal Highway Administration. This cash infusion will enable TON to hire professionals to get the project moving along more quickly. JD Tanner estimates that with the grant funding and continuing volunteer build days, 8-10 miles of trails can be completed, featuring a mixture of beginner and intermediate terrain layouts. He anticipates the first section of trails could be open by sometime in fall 2019. Tanner’s research indicates that when the trail is completely finished and open to users, it could potentially draw 55,000 or more users annually. Funding is still needed to complete the remainder of the trail circuit. Donations are being accepted online through the Southern Illinois University Foundation for the project. Additional opportunities for volunteers to help with the project await when the weather cooperates. Visit https://ton.siu.edu/facilities-and-services/touch-of-nature-forest/multi-use-trail-projects.php, call 618/453-1121 or email tonec@siu.edu for more information. Construction is underway on a 30-mile trail system for mountain biking, hiking, running and other uses. Learn more, get involved or donate online. 9:00 AM to 2:00 PM - McLafferty Annex: The Saluki Water Workshop is an annual high school outreach workshop sponsored by the Universities Council on Water Resources, a national professional organization housed in the Department of Forestry. Local high school freshmen and sophomores are invited to participate in a half-day of interactive workshops from SIUC faculty and staff from water resources areas of expertise.